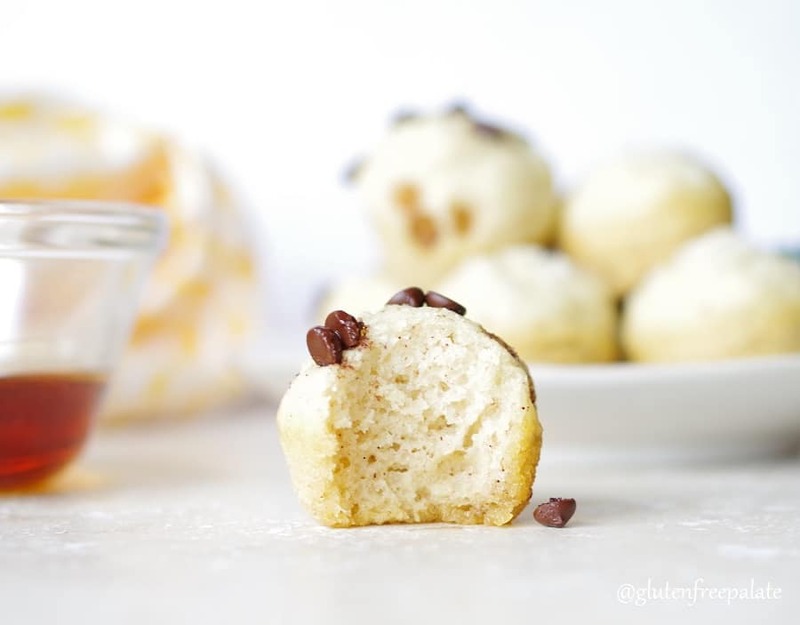 Gluten-Free Pancake Bites are an easy and quick breakfast that everyone in your family will love. Mix, scoop into a mini muffin pan, bake, and dip! As a busy full-time working parent I sometimes find myself in a pinch for a quick breakfast or snack that my two girls can grab on the go. That’s when I turn to pancake bites. You can make a bunch in advance (and freeze them) and they travel well – think lunch boxes, travel bags, to-go containers, etc. My girls have decided that they want to be in charge of breakfast for Father’s Day this year. I gave them a couple of options for recipes that they could make themselves, including a recipe for pancake bites. They’ve decided to have fun with it and make a variety of pancake bites using chocolate chips, blueberries, coconut, and almonds. We’ve already talked about doubling the batch so they can enjoy the remaining bites throughout the following week. With less than ten ingredients and two bowls needed for the recipe, and less than twenty minutes to bake, this recipe is simple enough that anyone can make it and it’s super easy to clean up afterwards. You can whip up a batch yourself or have your kids help in the kitchen. 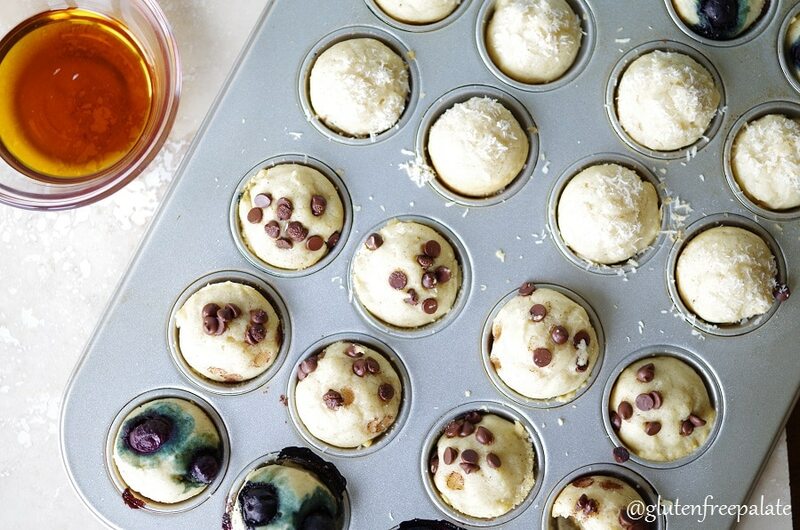 My girls are especially looking forward to mixing and pouring the batter and topping these tasty little Gluten-Free Pancake Bites with their favorite toppings (and Dad’s too). I am looking forward to seeing the looks on their sweet little faces when they present the breakfast they made to their dad on Father’s Day. If you like pancakes your sure to like my Gluten-Free Pumpkin Pancakes. Pumpkin isn’t just for holidays, it can be enjoyed any time. In the mood for crepes? Sandi from Fearless Dining makes incredible Gluten Free Crepes. Toppings like: shredded coconut, gluten-free dairy-free chocolate chips, blueberries. Preheat oven to 350°F (180°C). Grease a 24 serving mini-cupcake pan; set aside. In a medium mixing bowl whisk together flour, baking powder, baking soda, salt, and cinnamon. In a separate medium bowl, combine the maple syrup, egg, dairy-free yogurt, and oil. Add the flour mixture all at once to the wet mixture and stir just till combined. Do not over mix. 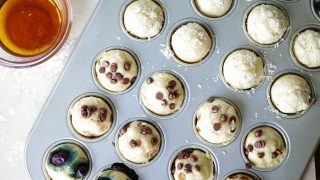 Using a tablespoon, drop one level tablespoon of batter into each mini-cupcake cup. Repeat until all cups are full. If desired, top with your favorite toppings. Bake for 14-16 minutes or until the tops start to brown and the center is set. Remove from the oven and cool for 10 minutes. Using a small spoon or butter knife, gently work your way around the edge of each pancake bite and lift out of the pan. Serve warm or at room temperature. Wow these look so yummy! I love that your girls took picked these so they can try different varieties! Smart girls! I think I’m going to use maple syrup instead of sugar. I think it would give it that breakfast taste when on the go. So cute, and I bet a total winner! Love this idea! What a wonderful idea! I adore gluten free pancakes and muffins and these are both! If you’re interested we would love to have you link them up to Savoring Saturdays! Thanks! You can also use milk, or dairy free milk in this recipe. I’ve used buttermilk as well. The problem for me with most gluten-free goodies is the fact I eat low carb as well. I love the idea of using the mini muffins for portion control. I just made some brownie bites this weekend. Great minds think alike! Can you use something in place of vegetable oil? You can use your oil of choice. Hope that helps! These make 24-36 pancake bites depending on how small the wells in your mini miffin pan are. I just made these– they’re great! I used Cup 4 Cup flour (160 grams, which is 1 1/4 c by weight according to the Cup 4 Cup bag) I also used SoDelicious vanilla yogurt. But I substituted melted coconut oil for vegetable oil, since we can’t do soy. I made a third of them plain, a third raspberry (1 frozen raspberry in bottom of each muffin hole, and one on top of the batter, and a third of them chocolate chip (3 chips in bottom, 3 on top). My kids DEVOURED them!! My husband loved them!! I loved them!! These will certainly be a family favorite for years to come! Thank you!! I have so much gratitude for you folks who are helping bring tasty gluten free dairy free recipes to our home! My son had So much joy on his face, eating these. So many times we have to say No to treats. So these are truly a gift. Thanks again! This made 29 mini muffins. I am so happy to hear that everyone in your family loved these pancake bites! Especially your son. Thank you for taking time to stop by and let me know.